Corrected an error on the Double D perfboard layout. Minor edits to the Whisker Biscuit schematic and perfboard layout. An error corrected on the Cab Sim perfboard layout. Minor revisions to the Nurse Quacky article. Added a heavily revised schematic and new perfboard layout to the Odie page. A small error corrected on the wah buffer perfboard layout. Minor revisions to the Sili-Face schematic and perfboard layout. Minor revisions to the Sili-Face II schematic and perfboard layout. Added a perfboard layout for Doug Hammond's Highway 89. Added a perfboard layout and some text revisions to the Cab Sim article. Added a sound clip of Doug Hammond's Highway 89, recorded by Gary Burchett. Added a perfboard layout of Gez' wah buffer to the wah mods article. Added a sound clip of the modified Vox V847 wah-wah. Added a new page: Vox V847 wah-wah mods. Visit the RunoffGroove.com online store! Another revision of the EA Tremolo schematic perfboard layout. Replaced the single EA Tremolo clip with three new sound clips. Added a perfboard layout for the modified EA Tremolo. Added a page for the modified EA Tremolo. Added the "Pulsing LED" mod by Darren Inwood and Rob Strand to the Phozer schematic and perfboard layout. Also corrected the Speed pot wiring on the layout. Added a sound clip of the modified EA Tremolo. Minor aesthetic revisions of the Double D perfboard layout. Added a Red Ranger sound clip. Revised the Purple Peaker schematic. Added a perfboard layout, transistor pin voltages, and minor revisions to the schematic on the Red Ranger page. Added a schematic of the Dan Armstrong Red Ranger. Here's a photo of my perfboard build of John Hollis' Crash Sync. Added a perfboard layout and revised transistor pin voltages to the Sili-Face II page. Added a revised schematic to the Sili-Face II page. Added a photo essay, How to remove the knobs of Ross effect pedals. Added two clips of Odie, recorded by Gary Burchett, to the Sounds page. Added a clip of Odie to the Sounds page. Added a new schematic of Odie, a JFET overdrive, to the Articles page. Minor revisions to the Splitter-Blend schematic. Added transistor pin voltages to the Sili-Face II page. Added a photo of my perfboard build to the Tube Reamer page. Added 4 clips of the Sili-Face II to the Sounds page. Added a new schematic and write-up for the Sili-Face II to the Articles page. Minor revisions to the Little Gem schematics and layout. Added Gary Burchett's schematics and sound clips of Grace 3.0 and Big Daddy. Added three revised schematics by WGThickPresence to the Angel Series page. Added four sound clips of the Tantalus Project to the Sounds page. Added the schematic and article for Gary Burchett's Tantalus Project. Added a clip for the RunoffGroove Cab Sim to the Sounds page. Added the RunoffGroove Cab Sim schematic and article. RunoffGroove.com is back from vacation and we brought you a present: The Double D two channel distortion! Complete with perfboard layout and two sound clips. Added a perfboard layout for the Phozer. Added two revised schematics by WGThickPresence to the Angel Series page. Added the Phozer, a simple faux-phaser effect, and four sound clips of it to the Sounds page. Correction to the Multi-Face perfboard layout. Minor revisions to the Whisker Biscuit perfboard layout. Added a perfboard layout and four sound clips of the Whisker Biscuit to the Sounds page. Added a photo of Gary Burchett's enclosed New Clipper. Added a write-up to the Nurse Quacky page. Added the Whisker Biscuit to the Articles page. Added three sound clips of the Nurse Quacky to the Sounds page. Added a perfboard layout for the Sili-Face and a photo of the official runoffgroove prototype. Added transistor pin voltages to the Sili-Face article. Minor edits to the Nurse Quacky schematic and layout. Fixed a small error on the Tube Reamer schematic and added a perfboard layout for it. Added a photo and perfboard layout for the Nurse Quacky. Added a schematic of the Tube Reamer to the Articles page and three sound clips of it to the Sounds page. Added a new article and schematic, the Sili-Face, along with two sound clips added to the Sounds page. Updates to the Fuzz Trek and Foxx Tone Machine pages. 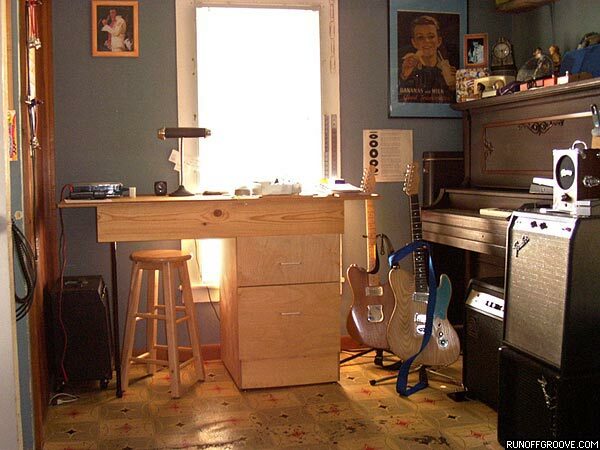 Here's a photo (79k) of the workbench drawer where I keep most of my favorite DIY effects. Added schematics for the Mockman and Nurse Quacky to the Articles page. New schematic and 4 sound clips of the May Queen. Fixed an error on the medium perfboard layout for the Uglyface. Three sound clips added to the Ross Flanger page. Two new schematics by WGTP added to the Angel series page. Two photos of my perfboard build added to the New Clipper article. Update to the Angel Duty schematic. Correction to the Little Gem schematic. Added a clip of the Little Gem MkII, recorded by Gary Burchett, to the Sounds page. Two new entries on the Fuzz Trek. Revision of the Little Gem Mk II schematic. Minor revisions to the Little Gem schematics and added a sound clip of the Little Gem, recorded by Gary Burchett, to the Sounds page. Added a page for the Little Gem LM386 amps. Alfonso Hermida sent a schematic of the Gretsch Tremofect. Added a schematic of the black Ross Phaser (made in Taiwan) to the Ross Phaser Guide. Added another clip of the Uglyface, recorded by Gary Burchett, to the Sounds page and a build report, also by Gary, to the Uglyface page. Minor edits to the Homemade Guitars. Added a template for the RadioShack 417-hole IC perfboard and revised the medium template. Added a perfboard layout for the Harmonic Jerkulator. Want to design your own perfboard layouts? Here are the blank templates. Added perfboard layouts for the Buzz Box, Differential Distortion, May Queen, and Multi-Face. Added perfboard layouts for the Bazz Fuss and Grace. Corrected a wiring error and added capacitor polarity markings on the medium perfboard layout for the Uglyface. Added a new article, with perfboard layouts, photos, and mods to Tim Escobedo's Uglyface. Minor edits to the Fuzz Trek and Gear pages. Photos of the Bulldog Cab Sim I built in a 35mm slide box: Photo 1, Photo 2. Added 3 clips of the Uglyface to the Sounds page. Sound snip (mp3, 213k): Purple Peaker driving EasyFace. Added photos and a perfboard layout to the 3 Legged Dog article. Paul Marossy kindly contributed a PCB layout (PDF, 149K) for the New Clipper. Added a clip by A. Colman of the Ron Black Tube Distortion to the Sounds page. Added a schematic of WGTP's Angel Duty. Added a perfboard layout, drawn by Gary Burchett, to his New Clipper article. Added two clips of a modified New Clipper to the Sounds page. Added a modification described by Gary to his New Clipper article. Added an entry for the Sam Ash Fuzzz Boxx, with transistor pin voltages, to the Fuzz Trek. Added Build a breadboard power module, an article and schematic designed to simplify breadboard projects that require an IC (integrated circuit). Added an article by Gary Burchett about the Dan Armstrong Blue Clipper. Added two clips of Gary's New Clipper to the Sounds page. Added two clips of the Electro-Harmonix Axis Fuzz (also produced as the 2-knob Guild Foxey Lady), recorded by Gary Burchett, to the Sounds page. Added two clips of the Gretsch Contro-Fuzz to the Sounds page. Added two clips of the Univox Squarewave, recorded by Gary Burchett, to the Sounds page. Added two more clips of the Sam Ash Fuzzz Boxx to the Sounds page. Added two clips of the Sam Ash Fuzzz Boxx to the Sounds page. Added a clip of the Muff Fuzz to the Sounds page. Added a clip of my NPN Silicon Fuzz Face to the Sounds page. Added sound clips of Gary Burchett's 3 Legged Dog and Grace 2.0 and Frank Clarke's Hot Harmonics to the Sounds page. Added a new schematic to the Grace page. Added a new page for Gary Burchett's 3 Legged Dog. Added transistor pin voltages for the Rocket, Obsidian, and Tychobrahe Octavia to the Fuzz Trek. Added a link for Matthew Hunter's photo essay detailing his construction of a Bazz Fuss to the Bazz Fuss page. Added another schematic of the Ross Distortion, drawn by Rob Strand, to the Ross Distortion page. Added a link for a Ross Phaser chronology guide (which includes two schematics), written by Rob Strand, to the Ross Phaser page. 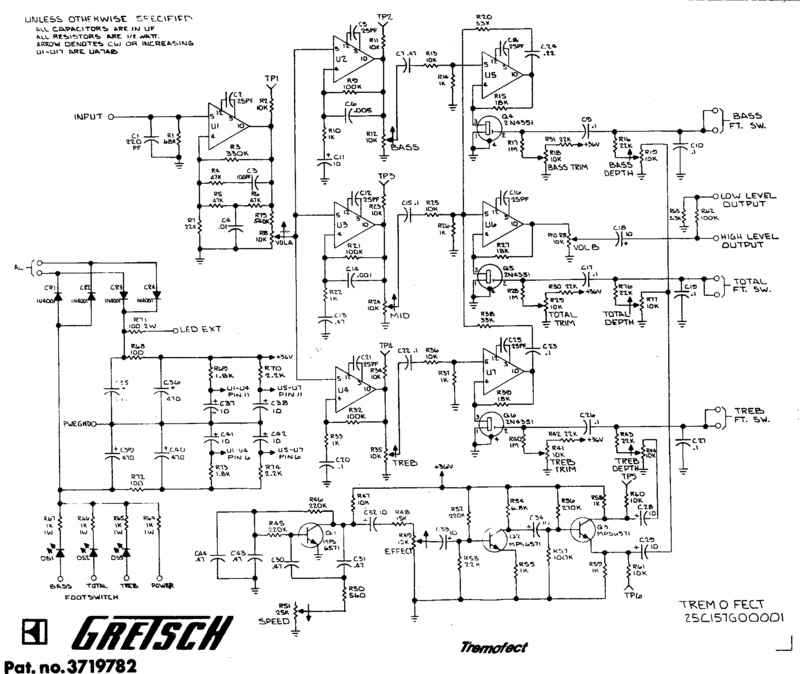 Added a schematic of the Ross Distortion, drawn by Rob Strand, to the Ross Distortion page. Added three sound clips to the Ross Phaser page. Added a schematic of the Ross Phaser, traced by Rob Strand, to the Ross Phaser page. Added a clip of Tim Escobedo's Idiot Wah, recorded by Gary Burchett, to the Sounds page. Added a link to Gilles Caron's website from the Ross Distortion page. New entry and minor edits to the Fuzz Trek. Replaced the four clips on the Bad Stone page with clips of better quality. Added three clips of Joe Davisson's Blackfire distortion to the Sounds page. Gary Burchett sent a new version of the SRPP clip. Added two clips of Tim Escobedo's Rambler and another clip of Tim's Jawari to the Sounds page. Added a clip of Tim Escobedo's Bootstrapped JFET Overdrive, recorded by Gary Burchett, to the Sounds page. Added a clip of the GEOfex SRPP, recorded by Gary Burchett, to the Sounds page. Added a clip of the Jack Orman MiniBooster, recorded by Gary Burchett, to the Sounds page. Added another clip of the Jawari to the Sounds page. Minor changes to the Fuzz Trek. Added a new page for Articles and Schematics. Links that were on the home page are now located on that page. Added an in-depth article by WGThickPresence describing his experiments with the Tonebender Mk II. Added a schematic for Christian's Buzz Box to the Bazz Fuss page. Added 6 sound clips recorded by Gary Burchett, to the Sounds page. Thanks, Gary! RunoffGroove.com now has over 100 DIY effect sound clips! Added a clip of an MXR Distortion Plus, recorded by Gary Burchett, to the Sounds page. RunoffGroove.com is 1 year old today! Added some technical notes to Fuzz Trek items. Bascially, this is for notes that don't need a full page. Visited Joe Gagan at the Nine Volt Nirvana headquarters and took a few photos. Here's the page of photos that Tom Pollock of Troubled Variance sent me. A photo of my workbench in the morning. Replaced the sound clip of the Bazz Screamer with a clip of the Deluxe Bazz Fuss recorded by Gary Burchett, on the Sounds page. Updated the Deluxe Bazz Fuss schematic with a revised version. Added four sound clips of the Foxx Tone Machine to the Sounds page. Gary Burchett sent a revision of his Bazz Screamer, now named the Deluxe Bazz Fuss, for the Bazz Fuss page. Added file size information to the rest of the Sounds page items. Made some server configuration changes; mp3 files should work better now. Many thanks to Matt Burnside of Tonepad.com for his expertise! Minor edits to the Fuzz Trek. Added six sound clips the Tycobrahe Octavia to the Sounds page. New item on the Fuzz Trek. Two photos added to the Ross Flanger page. Minor edits to the Multi-Face page. Found an old clip that I always liked: reverseguitar.mp3 (56k). Simple, just a little lick recorded and reversed in the computer. Added a page for the Untavia, and three sound clips of the circuit to the Sounds page. Added two sound clips recorded by Bill Bergman of his prototype looper to the Sounds page. Added a page for the Differential Distortion, and two sound clips of the circuit, one by me and one recorded by Gary Burchett, to the Sounds page. Added another photo to the Ross Phaser page. Added a photo to the Ross Phaser page. Replaced two of the photos on the Ross Distortion page with better quality versions. Added more photos to the Ross Distortion page. New item on the Gear page. Gary Burchett submitted the Multi-Face, an article and sound clip detailing his experiments with a modular Fuzz Face. Added a Harmonic Jerkulator (with Ge diodes) sample, recorded by Gary Burchett, to the Sounds page. Added another Overdrive Pro sample recorded by A. Colman to the Sounds page. Added a page detailing Tim Escobedo's Harmonic Jerkulator. Added 3 sound clips of the Harmonic Jerkulator and a clip of the AMZ Overdrive Pro, recorded by A. Colman, to the Sounds page. Added a clip of the Phase 45, recorded by A. Colman, to the Sounds page. Fixed an incorrect link on the home page. Added a sound clip of the New Obsidian, designed by Joe Davisson, to the Sounds page. Added links for schematics and designers' pages to the Fuzz Trek page. Tiny update to the Gear page. Added a sound clip of Grace, recorded by Gary Burchett to the Sounds page. New entry to the Fuzz Trek. Added a schematic of Grace, an overdrive designed by Gary Burchett. Minor edits to the Bazz Fuss page. Added two sound clips of the Green Ringer and a clip of the Obsidian Rev. D (by Gary Burchett) to the Sounds page. Updated the May Queen page with a revised schematic and some notes. Added an archive of past updates to the site. Added another sound clip of the May Queen (recorded by Gary Burchett) to the Sounds page. Added a sound clip of the May Queen to the Sounds page. Added a schematic of Gary Burchett's May Queen, a treble overdrive. Added a sound clip of the Bazz Screamer recorded by Gary Burchett to the Sounds page. Added 2 new schematics and notes to the Bazz Fuss page. Added notes and a second schematic to the Tonebender Mk X page. Added a couple photos of the Tonebender Mk X prototype. Posted 4 new sound clips from A. Colman. On the Sounds page. New page and schematic for the Tonebender Mk X. New page for the Casio VL-Tone keyboard. I'm a tightwad when it comes to circuit enclosures. Here's proof. Minor updates to the Gear and Ampeg Rocket II pages. Update to the Foxx Tone Machine page. Added clips of the Splitter-Blend to the Sounds page. Added sound clips and a new page detailing a quirky feature of my Electra Distortion clone. Added sound clips of A. Colman's Big Muff Pi clone and Zombie Chorus. New page detailing experiences of building a Foxx Tone Machine clone. Added sound clips of the Foxx Tone Machine. New page detailing experiences of building a Big Muff Pi clone. Includes A. Colman's build notes of his clone. Added sound clips of the Big Muff Pi. Added a new entry to the Fuzz Trek. New entry to the Fuzz Trek and updates to some older entries. Added 4 photos of the interior and 4 sound clips of the Bad Stone. Updated the schematic for A. Colman's Neoctavia. Posted two clips recorded by A. Colman of his Neoctavia to the Sounds page. Posted two clips recorded by A. Colman of the EasyVibe to the Sounds page. Minor edits to the Gear page. Made pages for three amps: Sundown, Musicmaster Bass, Rocket II. Added a picture of my Purple Peaker and a bit more text to the Purple Peaker page. Added pictures of the finished circuits to the Bazz Fuss and Splitter-Blend pages. No switches, no lids, no problem. Added a note about the Bazz Fuss v3 to the Sounds page. Added results of the Small Bear matched set of transistors to the Tonebender Mk II page. Added sound clips of the matched set. Added clips of the Bazz Fuss v3 to the Sounds page. Added Splitter-Blend page. The circuit provides two buffered effects loops and a Blend control. Added more text to the Purple Peaker page, added link on that page for original schematic. Re-organized the site for better navigation. Pages are now (hopefully) easier to find. E-mail me if you can't find something. Added sound clips for Tonebender Mk II. Added Tonebender Mk II page.